That’s right: perfume that makes you smell like a saddle. Irresistible. 2. A heavy duty barn coat that still looks nice. There’s nothing wrong with a big, over-sized brown monstrosity if it does the job. But wouldn’t it be nice to be able to do barn work in something like this? How cute is this? It would absolutely make the day perfect. 4. A horse-pattern rolling pin. So you can bake tiny little horses into everything. Excellent. 5. A Ralph Lauren riding jacket. 6. A $10,000 Hermes saddle. A high-tech saddle by one of the most expensive leather goods producers in the world. If somebody put it into my stocking, I wouldn’t say no. Everybody dreads getting socks for Christmas. But these are the perfect little Christmas gifts for people who love horses. A lovely little necklace that lets you wear your love of horses all day. Beautiful. 9. An actual Clydesdale foal. From people who really love you this Christmas, maybe you’ll get one of these. Some nice, simple little wooden foal earrings. A delicate, lovely gift. Flying has always been an aspiration of the human race since the beginning of time. Throughout the ages, through trial and error we got there and continue to improve in the aviation industry currently. Here are some of the highlights of the history in flying throughout time. The beginning of flight history in most peoples opinions is the Wright brothers flight. However, it was in the year of 1853 that for the first time a human ever left the ground in some kind of flying apparatus. The hang glider was designed by Sir George Cayley in Great Britain. Gliders continued to be worked on over the nineteenth century, and these findings influenced the the Wright brothers when designing their aircraft. 50 years later the first successful aircraft was designed and flew by the Orville and Wilbur Wright. Many others at this time were on a race to do achieve the same thing, but these two mechanics from Ohio beat them to it. 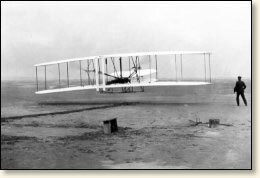 Their first flight occurred on the 17th of December 1903 in North Carolina, lasting 12 seconds and covering 120 feet. After 1903 the aircraft developed rapidly. More inventors begun taking an interest in flying and the aircraft’s became larger and better-controlled. Audacious flying goals were made, however not many were met. One of these goals was to make a transatlantic flight from United States to Europe. This was accomplished by a navy aircraft in 1919, with only one out of three aircraft’s leaving the US making it to the UK. The most well known transatlantic flight in history is when Charles Lindbergh flew in his aircraft named The Spirit of Saint Louis from New Jersey to Paris in May 1927. As airplanes became fashionable being such an exciting form of new technology, everybody soon wanted to fly in one. Due to this commercial airlines were created. The first airline formed was in 1913 and flew between St Petersburg and Tampa, Florida. This airline only lasted in business for one year, yet it was a milestone in the history of flight triggered the formation of dozens more airlines in the coming years. An exciting aviation goal was to achieve supersonic flight. Charles Yeager was the first to achieve such a flight in 1947 in an experimental plane. Future research being put into supersonic flight lead to the development of aircraft’s such as the passenger plane The Concord and the military reconnaissance plane named the Blackbird SR-71.